Chuck Taylors are so iconic that it makes it hard to imagine ways to tweak it according to today's trends and get away with it. I don't know how the geniuses at Converse managed to do it but they did and I got a first glimpse of these sophisticated Chucks yesterday at their flagship store in Glorietta. Speaking of the store, have you seen it? It is all sorts of cool. Just stepping inside gets you all excited. The walls are filled with grafitti art and the whole space has a feel of an underground subway station complete with tile work. 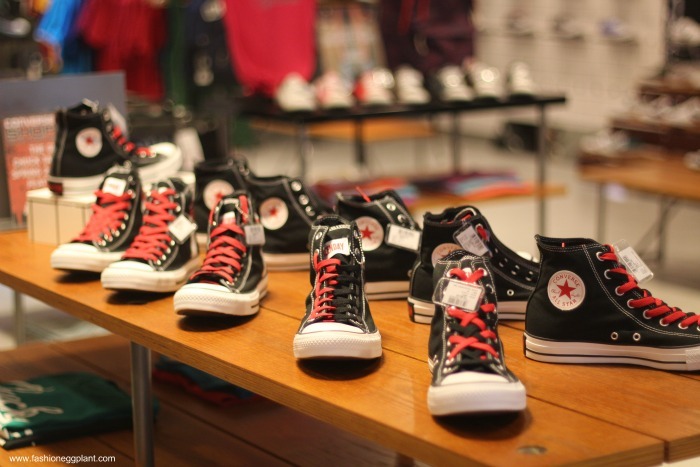 It started with lunch at Don Hen and a quick background review of the history of Converse. Did you know that they have been around for more than a 100 years and that Chuck Taylors were the first and best selling basketball shoes ever? After lunch we headed to the store and were surprised to be in the presence of photographer extraordinaire Mike Yu (he takes photos for fhm) and the news of a surprise and impromptu photo shoot! After shoot specifics were explained, it was time for us to scour the store and pick our favorite pair from the new ladies line and get photographed with it. and this cap that I totally fell in love with but have to wait for my hair to grow first before I pick it up. I look like a major tomboy wearing caps with my short hair. After much deliberation, I ended up taking home the pair I used during the shoot.